Back to School Snack! 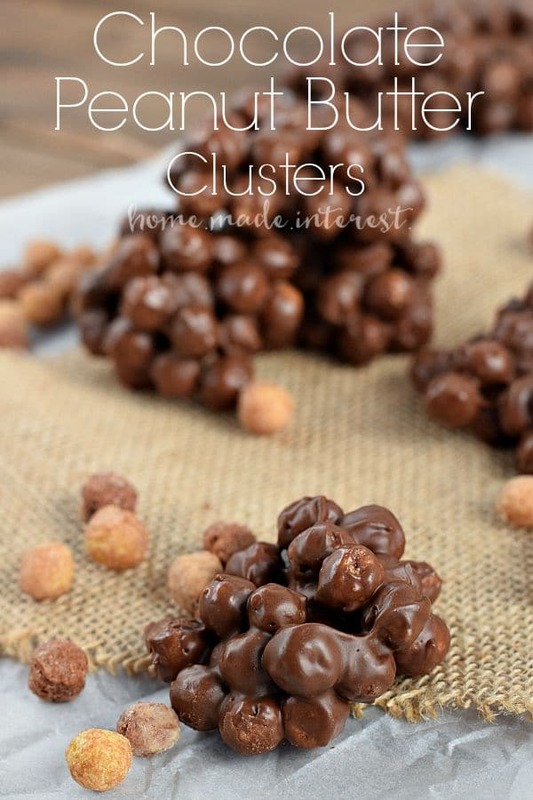 Chocolate Peanut Butter Clusters - Home. Made. Interest. 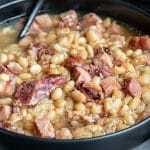 You’ve got to make a special back to school snack for the kiddos. 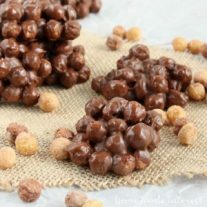 These Chocolate Peanut Butter Clusters are sweet, crispy bites that your kids will love. Well, we survived the first week of school. Oh my gosh, why didn’t anyone tell me there was going to be so much paperwork? Other than that it went really well. Putting my son on the bus that first day was a little tearful (more for mommy than him), but he has already made new friends and we’ve started to figure out a routine. I get him on the bus in the morning then take his sister to daycare. In the afternoons I pick him up and we come home and have an afterschool snack together and work on homework (I still can’t believe we had homework the first week!). I’m really enjoying that hour with him before we head to pick his little sister up. I mentioned the other day that I had joined the PTA. I want my son to have the best of everything and I think that starts with a good education. I know schools always need more money to fund programs and buy supplies. Now that I have a kid in school I have been keeping my eye out for ways that I can help. I’ve been noticing all of the Box Tops for Education™ labels on products I buy so I looked into the program. Box Tops is one of America’s largest school earnings loyalty programs. Each label is worth $0.10 for your child’s school and the school can use Box Tops cash to buy whatever they need, new technology, field trips, art supplies, etc.. Box Tops come on so many different products and I buy a lot of them so it is a pretty easy program to work with. I know $0.10 doesn’t sound like a lot but it adds up fast and when I was in Walmart the other day I saw that they have a bunch of products that offer bonus Box Tops. 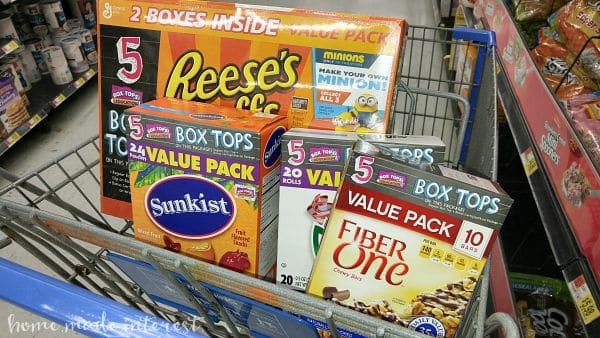 5 Box Tops per package, that’s $0.50 per item! I snagged a bunch of stuff that I needed and left with $5 worth of box tops from one shopping trip! One of the items that ended up in my cart was a two pack of Reese’s® Peanut Butter Puffs® cereal. One is for the kids’ breakfast but the other I used to make these simple treats as a special afterschool snack for my son. I’ll admit I ate a couple myself. They are so good! They were also really easy to make. I just melted chocolate and peanut butter together and poured it over the cereal. Then I dropped them in clumps on a baking sheet and put them in the fridge until the chocolate hardened. My son and I shared a few after his first day of school while he told me all about his big day. These chocolate peanut butter clusters make a simple snack or dessert. Microwave chocolate until it is melted and smooth. Add peanut butter and stir until mixed thoroughly. 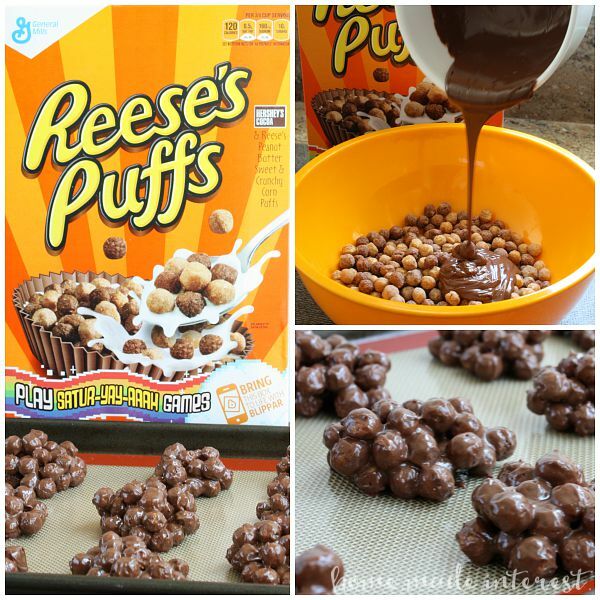 Pour chocolate mixture over cereal and coat it. Drop cereal onto tray in small clumps. Place in refrigerator to firm chocolate. Now it is your turn. The bonus Box Tops are only available at Walmart. Go out and pick some up and help a local school.